Today marks five years since my first post on Cookie and Kate. This date usually passes by without much fanfare, but five years! My baby’s in kindergarten now. Sniffle. This blog really is my baby. I bought all the ingredients to bake a cake to celebrate, then my dishwasher broke down. I’m not going to wash all those dishes by hand. 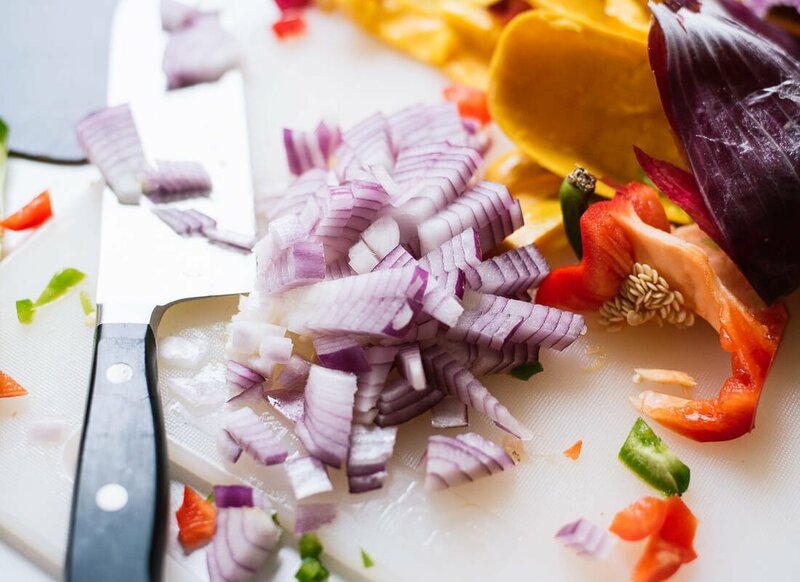 So, let’s shout happy birthday with this fresh mango salsa recipe! It’s irresistibly sweet and spicy, super simple to make, and outrageously delicious. Plus, it’s so colorful that it almost looks like confetti up-close. Come to think of it, salsa is actually the perfect anniversary recipe since my first recipe was for salsa. That post broke records for this blog back then. Three comments in one day! Thank you for visiting, commenting and sharing my recipes with your friends and family. I literally wouldn’t have posted more recipes if it weren’t for those comments way back when. You’re the best. 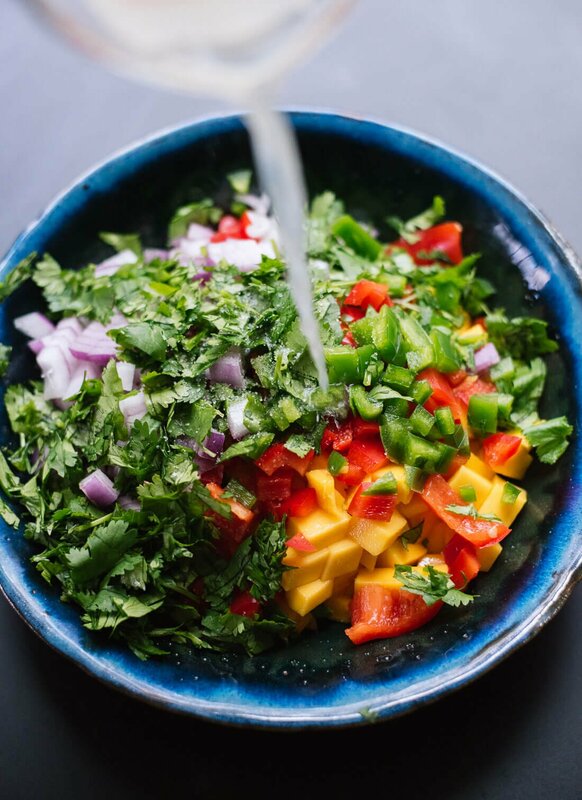 You’ll need only six basic ingredients to make this easy mango salsa: ripe mangos, red bell pepper, red onion, cilantro, jalapeño and lime. 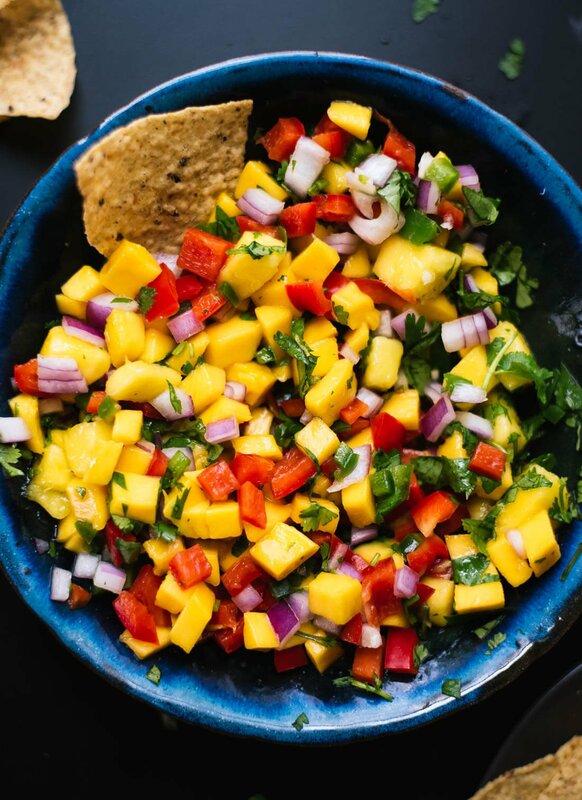 This mango salsa would be fantastic on fish tacos or just about any fresh, Mexican-themed dish, really. I can confirm that it goes well with chips, guacamole and black bean tacos. It was a big hit at my friend’s potluck dinner! You could also serve it on salad or just eat it straight out of the bowl as a salad. It’s that good. Please let me know how this recipe turns out for you in the comments! I love hearing from you. 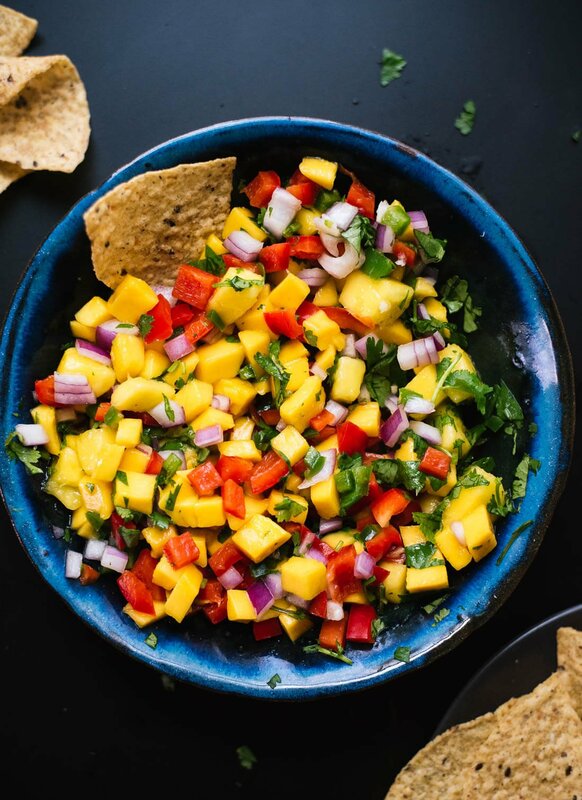 This simple and colorful mango salsa is super easy to make! It’s sweet, spicy and absolutely delicious. 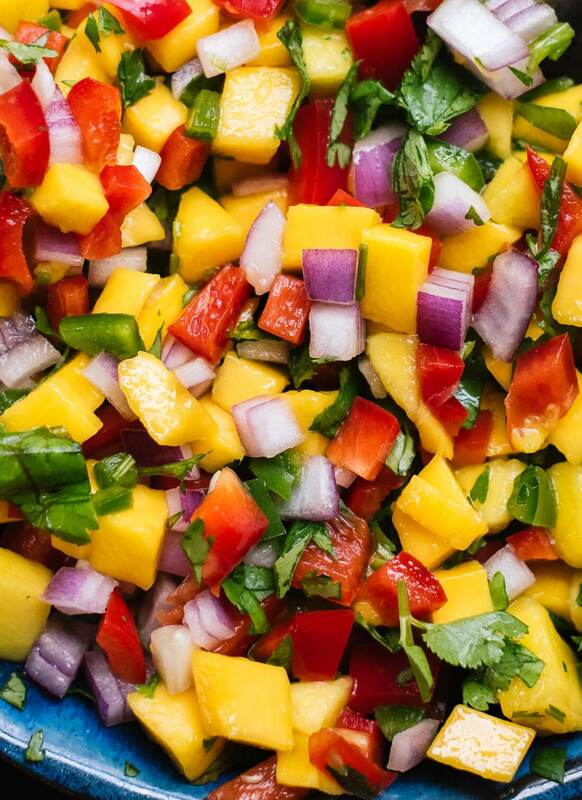 Serve this fresh mango salsa with chips, on tacos or salads, or as a salad itself. It’s that good. Recipe yields about 3 cups salsa. Mango salsa adapted from the mango pico in my Thai mango cabbage wraps. Storage suggestions: Honestly, I’ll be amazed if you have any salsa leftovers! You can store the salsa in the refrigerator, covered, for several days. It will be best fresh, though. How long will your recipes for fresh salsa keep in a small tight glass jar? Made it for a party and it was a hit!!! Great! I love hearing that, Lisa. Made this for a shower. Everyone loved it and I had to share the link with several ladies. Love this salsa on fish tacos and with quinoa. I have made it several times already and it is always a huge hit! Thank you, Hazel! So happy it works perfectly for you. Always appreciate the review. I am happy you were all still able to enjoy it without the cilantro. Thank you, Andrew for your comment! We had the mango salsa last night with the kids, it was Taco Tuesday and we changed it up. We loved it so much that today at work we had the leftover Mango salsa with corn chips and quesadilla’s it was awesome. thank you so much for the lovely recipe. Made the mango salsa as a topping for lime-marinated chicken tacos. It out shined the chicken! Can’t wait to make it again….thanks! Hi, Julie! I’m so glad to hear the salsa was a winner for you. Thank you for your kind words and review! You’re welcome, Sheeba! I appreciate the review. Made this salsa for birthday gathering. So yummy! Every single person enjoying it very much. So nice and fresh tasting, and an easy, simple recipe. Perfect with cold wine or sparkling water as a snack to kick off summer on a warm Memorial Day weekend evening. If we hadn’t run out of chips there wouldn’t be leftovers! The rest will be great for topping something grilled! Love all your recipes and photos are enticing and attractive. Thanks for sharing! You’re welcome, Maureen! Thanks for your comment and review. This recipe proved to be a great one for this first time salsa maker.. The flavors are exquisite, the texture pleasing and the fragrance of the combined ingredients stimulating. Can I make this salsa one day ahead or will it be too mushy? You can make it ahead, it will just get more juicy as it sits. It’s best served fresh, but can be stored for several days. I am making this recipe for the third time in two weeks to serve for Fathers day. Excellent!! We used it with marinaded grilled pork chops and with tortilla chips. My son said this was the only Mango salsa he ever had that he liked. Love that! What a great and fresh recipe for Father’s Day. Thanks for our star review. Just made your mango salsa recipe for my daughter’s baby shower, and yesterday found your recipe for baked Mexican brown rice…also made ahead for the party. Both were wonderfully easy and tasted delicious. I am excited to try the mango salsa on the sweet barbacoa I made with a pork loin–should make some delicious tacos. I was not familiar with your website before yesterday; now, I am totally a fan and following you on Facebook, Pinterest AND Instagram! #fangirl. Looking forward to exploring the website and finding new recipes to try. I’m so happy you made it and now following! Thanks, Lauren. I appreciate the review. Let me know what you think as you try other recipes. My wonderful mother shared this recipe with me. It is sooo good (healthy and simple!)!!! I made it mostly because I was pleasantly suprised (shocked) my mom knew how to share a link via text – septuagenarians can learn to text!!! Glad she sent it – deliciousness!!! I’m happy she shared it! Mom’s still do surprise us. :) Thanks for sharing and providing your review! Can you tell me why this recipe is so high in sugar and carbs? if i do all these ingredients in weight watchers it should be 0 points but based on your nutrients guide the carb/sugar is extremely high which brings this recipe to a 6 point serving?? any ideas? Mangos have a good amount of natural sugar in them, as well as some other ingredients have natural sugar as well. There is not added sugar, just what is natural occurring in the fresh ingredients. Great recipe! I used it as my base for ratios. Thanks. FYI – for things like lettuce and kale and parsley and cilantro, I prefer weight measurements. (I can fit a LOT of leaves into a cup – probably more than you intend for your recipe). Easy but oh so flavorful! And if you do have any leftovers, lucky you, even better the next day. Agreed! Leftovers are great. Thanks, Laurie. Just made this for a family BBQ. Ah!mazing!!!! Thank you for sharing! You’re welcome, Abby! If you would like to leave a star review, I would appreciate it! Of course! Missed it the first time around. The bowl was empty just on the first round! I usually just google recipes, pick one that looks good, skip right to the recipe and start cooking. The name cookie and Kate sounds familiar to me and I think I’ve made a few of your recipes before. However for some reason I started reading your blog and just loved it. I know this was posted a few years ago but can I just say this recipe is amazing. And I definitely be following your blog going forward. I’m glad you like it, Stephanie! Thanks for your review and comment. I added strawberries and it is awesome! Made this and added strawberries. This is awesome! Strawberries? I might need to try that one too. Thanks, Cathy! I added strawberries to this recipe. This is a great recipe. Thanks for the review, Cathy! Will you be at the KC VegFest this weekend? 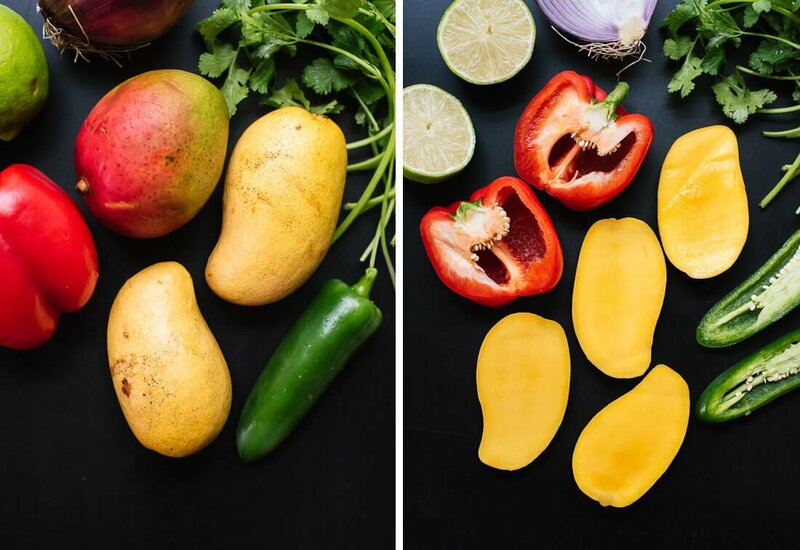 I don’t know where you get your mangoes, but some of the ones that grown in South Florida are so large that one would yield nearly enough for your recipe, which, by the way, sounds wonderful. I will use one, or maybe 1 1/2 mangoes to try this out. I’ll give it 3 stars for ease and anticipated taste. 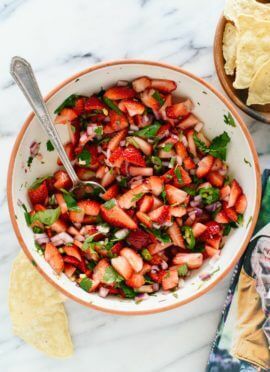 Great salsa, bright, fresh flavors, I definitely will make this again! Just made it, letting it rest. Will follow up with results in a bit. Looks delicious! What did you think, Tami? It was very good! Definitely a keeper! My husband was putting it on everything, and I don’t know of it keeps longer than two days because it was gone! Only change I will make is add a bit more spice- maybe 1 1/2 jalapenos to kick it up a bit more. It was soo good i made some for potluck and everyone loved it! 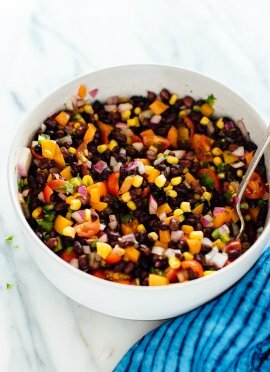 Delicious mango salsa. The only change I made was that I substituted red pepper flakes for the jalapeños. Thanks for sharing! Hi, I taught a cooking class for seniors at a health center yesterday and this salsa was a huge hit! I had some very ripe peaches so we threw those in also. There was squabbling over who would get to take home the “leftovers” lol! Delighted to discover your blog, love all the fresh flavors and great way to introduce new herbs and veggies. That sounds like a great time! Thanks for sharing, Wednesday. Loved this salsa. Had it with BBQ’d salmon. Everyone commented how delicious it was, so perfect with the salmon. Every scrap was eaten, I was hoping there would be some left that I could polish after they left. Will definately be making it again. Thank you so much for this recipe! I made it this past weekend to take to my book group because we had read “The House On Mango Street,” by Sandra Cisneros. Because I cannot eat bell peppers or jalapeños, I had my husband taste it before I left, and he was crazy about it! Then the other women at book group kept raving about how good it was! I followed another commenter’s suggestion and added a finely chopped avocado, but other than that I made it exactly as written. It was surely the most beautiful salsa I have ever made! I love the theme play, Dana! How fun. Thanks for sharing and for your review! Also added a little orange, and a bit more salt to taste. Went over very well. Oh, that sounds lovely! Thank you, Vince for sharing. I’ve made this salsa several times. 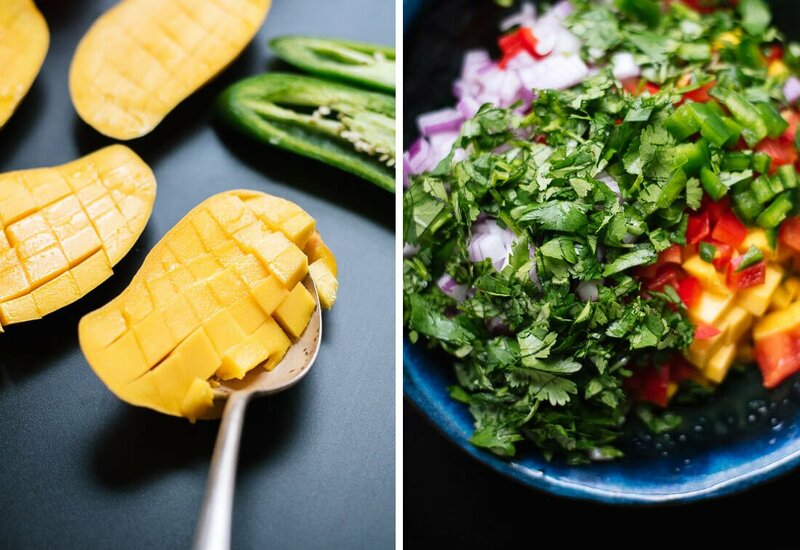 It provides the right balance of sweetness from the mango, heat from the jalapeno (I left seeds in) and freshness from the cilantro and lime juice. I ate half of it with blue corn chips and will finish it off with salmon tonight. Yummmm! Yes, I agree Charlene! Thanks so much for your review. This summer brought a bumper crop of mango to our Florida home, and I found this recipe online. Perfect for a women’s luncheon I was invited to. It was simple to make, looked beautiful and was delicious. Nearly every guest asked me for the recipe. I will definitely make this again. That’s wonderful, Vicky! Thank you for sharing. Hi Rae! You can subscribe to my mailing list, just scroll all the way to the bottom of the blog where it says stay in touch! Thanks so much! I’m glad you loved it, Sam. Thanks for your review! Wow, this is the most delicious looking recipe I have seen in ages. And mango season is just starting where I live (in South Africa). This is going to be a staple in our home for the next few months. I just discovered Cookie & Kate yesterday, and I’m in love!!! Making one of your enchilada dishes for supper tonight. I’m so happy you discovered C+K! Let me know what you think of recipes as you try them out, Colleen. Thank you for this recipe. 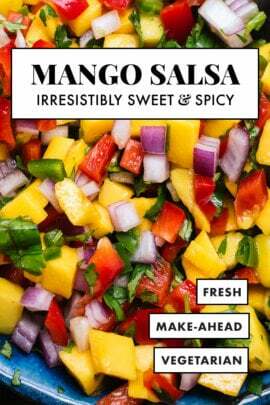 I buy my mango salsa pre-made from Target or HiVee. But I need a recipe I can make myself. I like to use the salsa in cooking. I just tried it with fresh salmon. I sauteed the salmon and the salsa together in a bit of olive oil and oregano, salt and pepper. During the last five minutes I added a bit of butter which help brown it a bit. Turned out delicious and left me wanting more. So will be making your salsa when I need a fresh alternative. Thank you for your comment! Please let me know when you try it. I will do that. I am mentioning your recipe in a small family newsletter along with my salmon dish. I would like to include your picture if that is okay, then include a link to your recipe. Love it too, best thing for dieters. Leftovers? I don’t think so! The biggest issue I had was finding some more ripe mangoes to make more… an hour after I made the first batch! Wow! Simple and delicious! We enjoyed the mango salsa with chips and on top of salmon! I’m glad you loved it, Alana! I used this recipe for a prawn and salsa pizza. It went down a treat. I used a shop bought prawn and mango dip on the base instead of tomato. 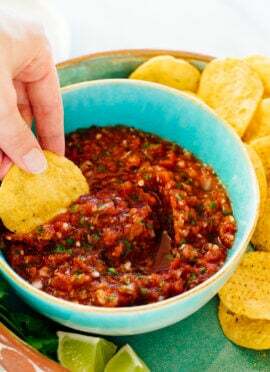 Very tasty salsa and so easy to make thanks for the recipe. Thanks for sharing, Ian! I appreciate the review. I have made this delicious salsa several times. So light, refreshing, and just screams summer! Today I only had one mango, but had papaya and cantaloupe, so included a little of each in the mix. Serving with mojo grilled chicken and yellow rice. Thank you for sharing, Mari! Just made this tonight to put on top of my wild baked salmon!!!! Yuuuuummmmyyyy!!! Thanks for such a great recipe!!! LOVE LOVE LOVE this salsa!!! Extremely easy to make delicious! !thanks for a great recipe!! Could I use frozen mangoes if I don’t have fresh? Or will that negatively affect the texture? Fresh are best here. I believe others have used frozen. Check the comments to see what they suggest. I would likely drain some juice as it thaws. Easy and delicious! This is perfect with salmon or swordfish. Thanks for sharing!